Christmas is almost upon us! The festive period brings parties with family, friends and work colleagues. Whilst it’s great to catch up with people at this time of year, it also means that we tend to over-indulge on luxurious food and drinks and unfortunately take part in little or no exercise. However, with a little forward planning and some discipline it is possible to enter the New Year feeling fitter rather than fatter. It is reported by the British Dietetic Association (BDA) that the average person gains 2kg of weight over Christmas and the New Year due to all the extra calories consumed. Whilst weight gain is common at this time of year, don’t use it as an excuse to let go – just choose healthy options to keep that waist line in trim and avoid dieting come January. To avoid dipping into high calorie snacks during the day, start with a healthy breakfast such as porridge oats or a smoked-salmon bagel to keep you feeling full. Avoid canapes and crisps, instead opt for fresh vegetables with low fat dips and consider healthy alternatives like chestnuts, dates and satsumas. When it comes to Christmas dinner, turkey is a leaner option than duck or goose. A great meat alternative is a nut roast. Try not to overcook your vegetables and don’t add butter to them. Make sure that you fill your plate with vegetables to leave less room for stuffing and pigs in blankets and avoid eating the skin of the bird as it is high in fat. If using the meat juices for gravy let it stand first so that the fat rises to the top and then skim it off. Christmas pudding is high in calories but stick to a smaller portion and try half-fat crème fraiche instead of brandy butter, or have a fruit salad instead. Try to recognise when you are starting to feel full and stop eating as it can take a while for your brain to catch up with your stomach! It’s tempting after a big meal to slob out on the sofa but try to get up and moving half an hour after your Christmas dinner to work the extra calories off. Enjoy a long walk in the crisp winter air or a bike ride with friends or family- which is an ideal opportunity to try out any new bikes or scooters received as Christmas presents. If you fancy something different, why not try a session on the indoor snow slopes which can be a fun affordable alternative for all the family? 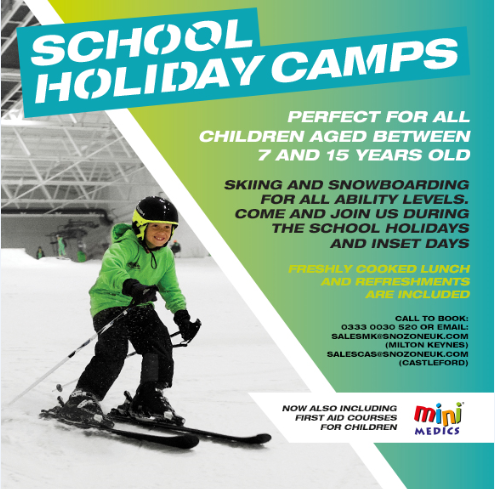 We offer ski and snowboarding lessons and family fun events like Sledging and Sno-play for children and only close on Christmas Day. Making sure that you stay active over the Christmas period will not only stop you gaining weight but will also help energise you, reduce stress, give you a break and mean that you start the New Year in good shape!